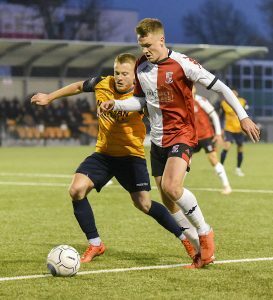 BEN Gerring made amends for his own goal against Gloucester City to score the winner against Slough Town and send Woking back to the top of the National League South table on Saturday. The defender’s 30th minute strike was enough to give The Cards their third away win in eight days; albeit they were made to work hard for the three points against a tenacious Rebels side. Josh Jackman reflected the nature of the first half proceedings when he managed to outwit three Woking players before firing over the crossbar, which typified The Rebels lack of composure in front of goal. The miss proved costly for the east Berkshire side when Max Kretzschmar’s corner kick was stabbed home by Gerring to give The Cards the lead on the half-hour mark. The Rebels continued to put the visitors under pressure in the second half, but The Cards’ defence remained resolute as Woking moved back to the top of the National League South table.